A group of academics represented Birmingham City University in front of a worldwide audience when they took part in the Commonwealth Games Handover Ceremony. The first ever fully choreographed live handover across two continents in the history of the Games, the Handover Ceremony was shown to a global audience of approximately one billion people. The Handover Ceremony involved the Commonwealth Flag being passed from the Gold Coast to Birmingham with a welcome from young people and artists that represented what Birmingham 2022 will offer. Pre-recorded segments of the Birmingham 2022 Handover were filmed in Birmingham City University’s cutting edge Curzon Street Studios – including Europe's largest static green screen – in the institution’s £62 million Parkside Building earlier this week. Meanwhile, Jacqui Findlay and Louise Turner, who both teach on Birmingham City University’s Stage Management course in the Royal Birmingham Conservatoire, helped put together a spectacular showcase of young talent that was broadcast live from Birmingham city centre during the Handover. As Cast Managers, they oversaw intensive rehearsals at Edgbaston Cricket Ground as the performers learned a routine from award-winning choreographer Rosie Kay. The show also featured Birmingham Royal Ballet, including Principal dancer Céline Gitten and the People’s Orchestra, the unique performance was set to ‘Mr Blue Sky’ by Jeff Lynne’s ELO, one of the city’s most successful bands. The piece was shot in one single uninterrupted camera shot and travelled across Victoria Square, ending with an aerial shot of Birmingham welcoming the world. It was such a dream come true to be part of this historic event. It's so inspiring to work among such talented people from across the city and the collective passion for Birmingham and our region was palpable among the cast and crew; it felt like Birmingham 2022 is already here! Jacqui Findlay, Manager of the Production Department and Course Director, Stage Management, Royal Birmingham Conservatoire. The title of Birmingham’s handover was ‘Go The Distance’, taken from the song by Lady Sanity which she performed live in the Carrara Stadium in the Gold Coast, Australia. The title sums up the start of the journey by the city and region towards staging the Games in four years’ time. It also speaks to the mix between sporting and culture activity that will be showcased over this period. ‘Go The Distance’ also perfectly describes the challenge that this handover undertook; to stage for the first time in Commonwealth Games history a fully choreographed segment live between two continents, going the distance between Birmingham and the Gold Coast. Drawing on the city’s pool of talent, a young and diverse team of artists led Birmingham’s handover ceremony. Culture Central, of which Birmingham City University is a member, is the development organisation for culture in the Birmingham city region and was appointed by Birmingham 2022 Games Partners to organise the Handover. Film-maker Daniel Alexander has also captured the heart of the city in a short film titled 'We’re From Birmingham’, championing the people and places that make Birmingham unique, and a must-visit destination for 2022. 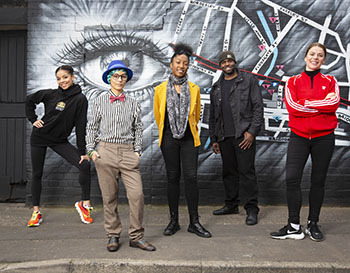 The film, partly captured at Birmingham City University, features iconic buildings of the region and focuses on its many communities – the people of Birmingham, its diversity, its youth culture and the energy that buzzes throughout the city and region. The film uses a track called ‘Birmingham (Anthem)’ by local band Lotto Boyzz, who worked with Daniel on the soundtrack. MC Lady Sanity performed her track ‘Go the Distance’ live in the Carrera Stadium, Gold Coast. Also performing was her Birmingham-based band Role Models featuring Ashley Allen, George Patrick Foley, Carl Gordon Browne and Ryan Browne. The track is about being persistent in moments when you’re feeling discouraged, whether that’s from self-doubt, doubt from peers or living up to big expectations. Birmingham Poet Amerah Saleh performed a specially-commissioned short spoken word piece, ‘Tourist in My City’, about the notion of the Commonwealth and what it represents for young people. Amerah’s performance represented the voice of young people in Birmingham, inviting the world to join them in four years’ time. ‘Go The Distance’ was screened live on BBC Two from 11am on Sunday 15 April.